Suppose you store music files on a computer in your study, but you'd like to have access to those sounds while you're in the kitchen, bedroom or any other room in the house (without spending silly money on a whole-house distributed audio installation). 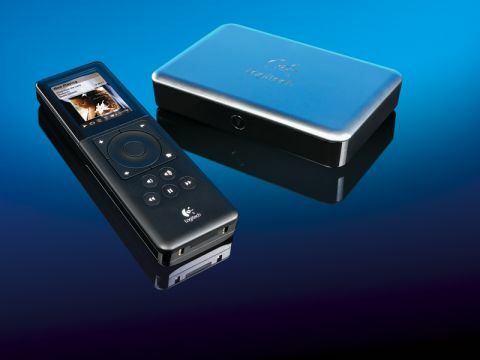 The Logitech Squeezebox Duet provides a cost-effective solution: £279 buys a receiver and controller for the first room. That controller will also operate any other £99 Squeezebox Duet receivers — along with other models from the range including the audiophile-grade Transporter — that you may decide to add in other rooms. There's no need to have a hi-fi in those secondary rooms: a pair of active speakers is all that you require. Setting up a Squeezebox Duet consists of installing two components: there's the receiver, which you connect to your system amplifier (or active speakers) and the wireless controller (along with its charging cradle) that acts as the user interface with the device. The third component, which isn't included in the box, is a networked computer on which you run the free SqueezeCenter software that acts as the brains of this outfit. The Duet will connect wirelessly through Ethernet, or in a hybrid network, mixing wired and wireless connections. This is the arrangement we used, with control being wireless and music travelling through reliable Cat5e cabling. While the Squeezebox Duet plays music files that you have stored on your computer it will also, provided you have a broadband internet connection, let you listen to internet radio. As far as stored music is concerned the Squeezebox Duet and SqueezeCenter support a wide variety of formats, both uncompressed and compressed. Formats that the receiver hardware cannot support natively are converted to be playable through transcoding provided by SqueezeCenter. Transcoding is not an altogether good thing so stick to native formats whenever possible. Usefully, SqueezeCenter can also use the iTunes music library. However, it cannot play songs purchased from the iTunes Music Store if they are protected by Apple's FairPlay Digital Rights Management (DRM) software because Apple refuses to license that to other hardware manufacturers. For what is an extremely high-tech piece of equipment, the set up procedure is a fairly straightforward affair, so long as you follow the instructions. If you don't, then it's a simple job to reset everything and go through the setup again... this time as instructed! And for what is not an especially expensive piece of equipment, it seems well thought-out and neatly put together. The controller is the star of this show, with its configurable 2.4-inch colour LCD screen and its iPod-style scroll wheel and straightforward controls. We auditioned the Duet using an uncomplicated, but revealing system comprising a Naim SuperNait amplifier, Chord Company interconnects and loudspeaker cables and Neat Petite loudspeakers on Partington stands. The Squeezebox receiver provides both analogue and digital outputs, with the latter being either coaxial or optical. We used the coaxial option and fed it through the SuperNait DAC, which offered improved performance over the integral DAC in the Squeezebox. We set up networking using a Cat5e cable connection — which suffers none of the noise and hash that mars wireless transmission and delivers better dynamics and low-level detail — routed through a metal-cased Netgear Fast Ethernet switch to the PC. Feed the Duet a good signal and it delivers a highly respectable performance that will wipe all thoughts of how little it cost from your mind. Do as we did and play it through a decent DAC and we reckon you'll be absolutely delighted with this sub-£300 purchase. The sound isn't the finest in terms of transparency and openness, but it delivers a reasonable degree of insight with laudable dynamics. Voices and instruments have credible character, realistic tone and timbre and they exhibit fine note shape, especially acoustic guitar. At its worst there is a slight veil hanging in between the band and the listener but musically, in terms of pitch, timing and coherency, the portrayal is very satisfying. Albert Collins and B.B. King's marvellous reworking of Stormy Monday on Blues Summit is rendered beautifully with the duo's guitars and vocals cutting distinctly through the mix and standing proud of the orchestra playing behind them. Drums and cymbals have similar clarity and attack and even the bass, which isn't unduly prominent in the mix, makes its presence felt and contributes to the track's gentle, meandering rhythm. However, it's the guitars that stand out in both the literal and figurative senses. Razor-sharp leading edges and crystalline definition of the ADR envelope (attack, decay and release) not only help the listener distinguish between the instruments but also clarify the situation when B.B. gets a little jazzy and vocally mimics the melody he's playing on his guitar. His duet with Etta James on the same album best demonstrates the system's musical empathy: its timing acuity emphasises the subtle interplay between B.B., the orchestra — in particular the drummer — and the singer. A recording of the scherzo from Beethoven's Ninth Symphony confirms our suspicions that the Duet's soundstaging seems shallow, but in every other respect the box delivers a commendable performance. Playing a selection of high-quality, high- definition FLAC downloads, whose purpose is to demonstrate the quality attainable with such material, including The Minnesota Orchestra, the Squeezebox turns in a sterling performance, sounding sharply detailed, fittingly dynamic, delightfully vibrant and musically rewarding. Instruments are rich in harmonic texture and the orchestra positively leaps from the speakers, apparently free of any constraint by the enclosures. Toumani Diabete's Symmetric Orchestra album Boulevard De L'Independence demonstrates the system at its most open- sounding. Each of the 21 strings on the leader's Kora displays a wonderful vibrancy and a rich resonance. The system excels dynamically on this recording, in particular in the way it conveys the brass section's incisive stabs and the fierce percussion. Especially delightful is the way it renders transients with such completeness and solidity; not with just the high-frequency portion of leading edge, but with the whole weight and low-end content of the note rendered with full force. Experimentation shows that the Duet, although not an ultra-revealing audiophile device, can be rather discriminating about the recordings you play through it, especially when it is connected through a suitably open- sounding external DAC. Although with that in mind, we recommend that you stick with well ripped WAVs and FLACs, if you're going to play the Duet through a good-quality hi-fi and want to hear it at its not inconsiderable best.